Overall, a 5kW solar system that is installed in a home in San Antonio, Texas is going to produce about $669 of electricity per year with the current electricity costs of about 10 cents per kilo watt hour. If the prices of electricity increase, the dollar value of the electricity produced will also increase while the rest of the variables stay the same. If the prices of the electricity for example doubled in price to a homeowner, the amount of electricity in dollars that the solar system would produce annually would double as well. This study is going to review what the expected solar panel costs will be for a medium sized home solar electric system in the state of Texas. We will look at the system costs, incentives available, expected electricity amounts, and some other variables that are common to a prospective solar energy buyer. If you have any questions, please be sure to leave a comment and I will answer you right away. You can look at the picture below to get a feel for what this actual solar panel system might look like if it were installed on your roof. The expected labor costs for this system could be anywhere from $4,000- $6,000 depending on what company you decide to work with for installing your system. Bryan Texas Utility customers can look forward to a solar panel incentive of up to $2.00/watt AC or $6,000, whichever is less. more information on this program is found at the Bryan site. The 30% Federal Solar Tax Credit is something that everyone can make use of. This is a tax credit you can take for 30% of the total cost of your solar panel system. Understanding how many hours of sun your solar panels are going to receive each day is a very important part of a solar systems performance. 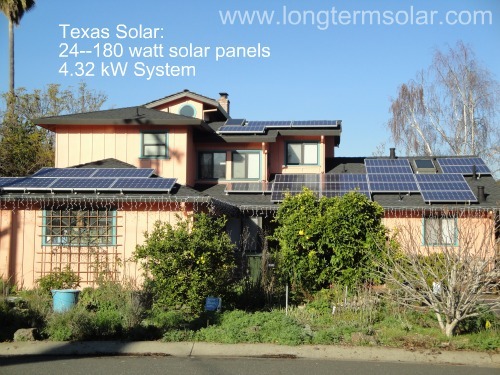 Texas is a great location to setup a solar electric system for many reasons, but one of the main reasons is based on the excellent amount of sunlight the state receives. Axis Tracking solar systems are going to have higher performance numbers always in terms of kilowatts of energy produced. The main reason is they have more direct sunlight hours hitting the axis tracking solar panels. Solar systems that pivot and follow the sun are great, but at the same time the prices for them are higher. You want to talk to a solar professional prior to purchasing any type of solar system, and make sure to get a clear estimate on how many hours of sunlight the systems should be expected to receive on average each day. Every solar electric system installer should be able to provide you with this information.